An Italian climber has been found dead on Mont Blanc, one of a party of three who attempted to climb to the summit, rescue workers say. Authorities recovered Luca Lombardini, 31, on Friday, three days after the trio went missing. 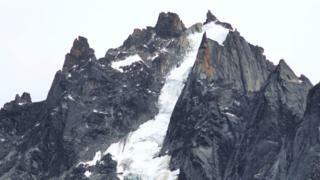 An official speculated that his fiancée and brother were likely to be buried beneath ice and rocks nearby. France restricted access to Europe’s highest peak last month because of safety concerns. The decree stipulated only climbers with a booking at the high-altitude shelter known as the Gouter were free to head for the summit via the easiest and most frequented route. The trio were climbing the mountain as a birthday present to Lombardini, and reportedly slipped and fell from a ridge around 3,400m (11,100ft) high on the Aiguille Verte peak in the Mont Blanc massif. Rescuers had to cut the rope connecting the three climbers to recover his body, and will try to get the bodies of fiancée Elisa Berton, 27, and brother Alessandro, 28, on Saturday. The Mont Blanc massif – a collection of 11 peaks rising more than 4,000m above sea level – is extremely popular with walkers and climbers but is Europe’s deadliest mountain range. Roughly 20,000 people attempt the climb every year. This accident means 15 people have so far died on Mont Blanc during the 2018 climbing season, compared to 14 deaths and two missing last year. Overcrowding on the mountain combined with this year’s hot summer, which has melted ice and made the ground more unstable, have increased risks for climbers.